Cricket Depth: Ravindra Jadeja: Match winning performance! 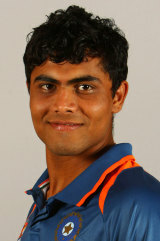 Ravindra Jadeja: Match winning performance! Today, Ravindra Jadeja took Chennai Super Kings over the line by his all-round performance against Deccan Chargers. He starred in a good innings adding 48 to the board after given out hit wicket. He hit 3 fours and 3 sixes! He also contributed with the ball with great match figures of 4-0-16-5. No doubt he was the Man of the match.